Past and Present Guises of "La Tour"
It's hard to believe that when the Eiffel Tower was first unveiled for the Universal Exposition of 1889, it was deemed a horrible eyesore by many, who found its bold modernity a shock. Now millions of people each year throng on the tower, both for its fascinating construction and its superb views over the city, but it's interesting to look back on the tower's many guises over the years. We start with the present but make sure to click view the full gallery to see some truly intriguing historical shots. 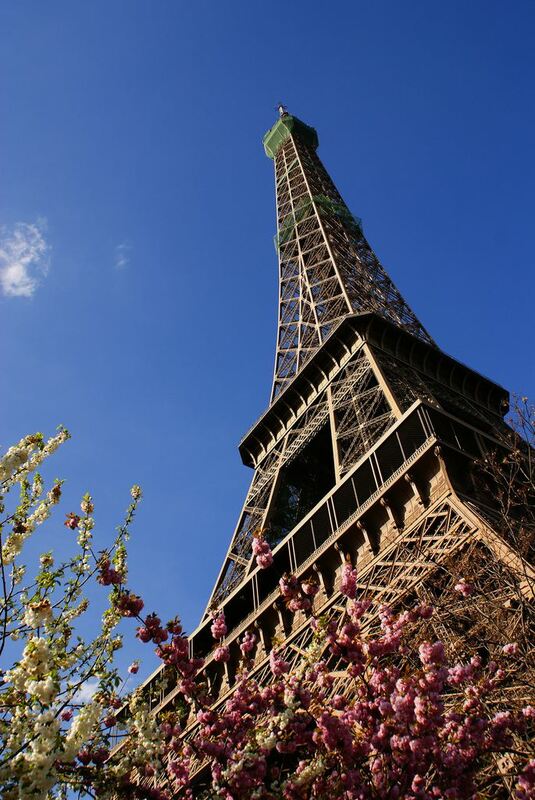 Pictured here - La Tour Eiffel in Spring: This poetic shot of the Eiffel Tower during the springtime shows how much effort the city of Paris puts into maintaining the gardens around the tower. This guarantees dramatic and memorable perspectives of trees and blossoms during the spring. This dusky view of the Eiffel Tower and the grandiose promenade around the tower known as the Champ de Mars also gives us some stunning perspectives on the city landscapes surrounding the monument. When France assumed the presidency of the European Union in 2008, the Eiffel Tower was lit with the colors and insignia of the EU flag, as shown in this shot. This vertical perspective of the Eiffel Tower in Paris, France gives us a closer look at the elaborate metal latticework that was at the time a true feat of engineering. The use of steel and other metals were still relatively new in architecture in 1889, and while the tower was at first deemed an ugly monstrosity, it would influence countless architects and engineers in years to come. This archival shot of the Eiffel Tower during the construction phase was taken in 1878 when photography was still a fledgling technology. The tower is constructed of 18,038 pieces, including 7,300 tons of metal, for a total weight of 10,100 tons. It stands at 324 meters/approx. 1,063 ft. It took a total of 2 years, 2 months and 5 days to complete construction, and contrary to popular belief, the architect behind the project was Stephen Sauvestre—Gustave Eiffel was the contractor hired to plan the project. Georges Garen, 1889. Public domain. Georges Garen's 1889 painting of a newly inaugurated Eiffel Tower lit spectacularly for the Universal Exhibit of 1889 gives a dramatic sense of the tower's unveiling in Belle-Epoque Paris. This surrealistic shot of the Eiffel Tower was taken for the occasion of the Universal Exhibition of 1900 by American photographer William Herman Rau. This dramatic shot circa 1902 shows the Eiffel Tower in Paris being struck by lightning. The Eiffel Tower, which has been used as a radio antenna, has also been described as a gigantic steel lightning conductor.